I managed to get these 9 made and the November blocks mailed. Keep an eye out winners. I liked this block. 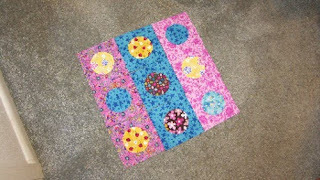 It was challenging for one who does not like applique, but enjoyable to use some of my stash. How pretty! I think some variation of "try it, you'll like it," (or, at least, it's not as hard as you think and won't take as long as you imagine) may be the theme of this month. I'm hoping that the fact that you made blocks means you are healing nicely from your surgery. Your blocks also had me thinking about how the polka dots might look in a strippy set. I don't know why these polka dots have me brainstorming quilting ideas. I am healing far faster than expected. It might have helped to have spent 4.5 days in the hospital instead of overnight. Plus, I have to be in Court Monday morning and I have no real choice. So getting better is the best option.